It’s FUN, FUN and FUN...Our 10 Week Foundation Level Football Coaching Programme. Our Sunday aKidamey sessions are available to join now. Our FUN, FUN, FUN structured sessions are delivered by a DBS certified and experienced aKidamey FA Level 2 qualified coaching team. Way back in 2006 the aKidamey started at Runcorn's Heath public park, today the aKidamey is based at our very own Halton Sports Complex with Café, toilet and baby changing facilities available during sessions. Players are constantly assessed for group progression. 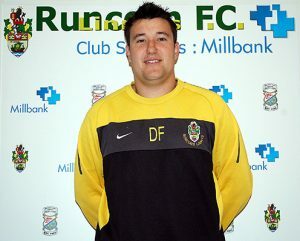 Founded in 2006, Runcorn Linnets JFC established the junior training Akidamey and introduced a new innovative way to coach and school young boys and girls in the art of football. The Akidamey is a Halton Community Sunday Soccer School, with a successful 12th year history of providing quality, fun football coaching sessions open to all children between 3 and 11 years of age, regardless of ability. We develop beginners, or players who are currently playing for other local clubs and just looking for a bit of extra training. Due to the success of our Akidamey, over the thirteen years we have been able to introduce multiple new Under 7's boys and girls teams into various Junior Football Leagues every season, purely based on players that have attended our Akidamey sessions. We continually add to and strengthen our existing older teams as well as accommodating new development teams across Foundation Level age groups. Unlike other local Soccer Schools our sessions are not purely focused on making money, we are community focused and many children that attend our sessions play for or go on to play for other Halton or surrounding area based junior teams. What Makes the aKidamey Different from any other Soccer School? Our Akidamey session programmes are structured, fun, fun, fun training sessions to help children improve their core skills and development. Our sessions are not somewhere for parents to send a child to just to kick a ball and muck about with jumpers for goalposts. Runcorn Linnets Akidamey forward thinking, experienced Football Foundation Level Development coaches deliver a structured development session programme that is inline with our overall Club Philosophy which was devised and developed by our Junior Director of Football (Premier League 1st team coach). Our fantastic development environment keeps the Club at the forefront of grassroots player development in the Halton and the surrounding area. 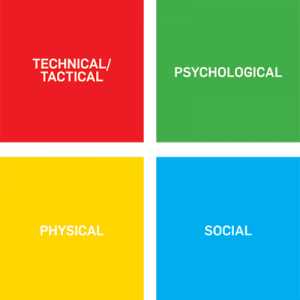 Technical - Ball Mastery, Technical Development, and Small Sided Practical Games. Psychological - Player Learning, Motivation, Self Esteem, Respect. Physical - FUNdamentals and ABC's (Agility, Balance, Co-ordination and Speed). Social - Make New Friends, Develop Confidence. Why would you take your future little footy stars anywhere else in the area? Working with our experienced Akidamey Head Coach Dan Flanagan is career coach Zak Pearson and some excellent up and coming young coaches, as well as some of the Clubs U6s, U7s and U8s coaches making a solid core group of coaches. Dan & Zak's 10 week programme it combines numerous fun ways to learn about the three ABC's of core FUNdamentals of Movement - Ability, Balance, Co-ordination and Speed (that benefit young people in any sport - not just Football) along with Ball Manipulation (skills) with Small Sided Game Play Practice, as Linnets Akidamey continues to improve its standards and push new coaching ideas at grassroots level. Providing we have places available, children are welcome to join at anytime during the programme. The age range of the Akidamey is 4 to 11 years old (Pre School & Primary School Children). 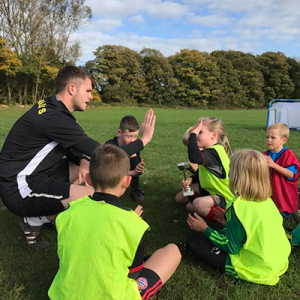 The aim of Runcorn Linnets Junior Football Club Akidamey is to create a fun, warm & safe environment for youngsters to learn and enjoy the art of football. All parents/guardians MUST ensure that when their child attends the Akidamey they are wearing appropriate clothing to reflect the weather (Hat & Gloves if necessary), Football Boots, Shin Guards and have access to a non-fizzy drink at all times. Failure to do so may result in your child being turned away from a session, ensuring the Club continue to adhere to FA Guidelines for Child Safeguarding and Best Practice. If you are a parent, young person (Male or Female) or just a football nut that wants to get involved with coaching, or maybe you have plans to build and manage your own junior team around your son or daughter, then please do get in contact with us. We look to develop our coaches as well as our kids and you’ll be given financial support by the Club to achieve your FA coaching badges. Our motto is ‘You don't have to be good to start, but you have to start to be good’!!! Come and join the Linnets party! If you have a Facebook account please LIKE our Akidamey page CLICK HERE this is where the team will post if for any reason the sessions are cancelled.